Via Groups: Users must be registered and log into ClassMarker to take tests. Via Links: No user registration required, embed tests in your website and more. Both of these methods offer you many settings such as Time Limits, Test Availability dates, control over feedback and results views, provide custom certificates, Access control and limit the number of attempts allowed. All of these settings can be different each time you make a test available and can be changed in real time. Today we will look at how easy ClassMarker makes Access control and Limiting quiz attempts. With groups, because each user is registered into at least one Group, when they log into ClassMarker they can only access the tests you have assigned to their Group/s. You can limit how many times users can take a quiz from "One attempt only" to "Unlimited attempts". This setting can be different each time you make a test available and can be changed in real time. Edit the Assign Settings for the Group by going to yours Groups page and selecting "Settings" next to the Test. Now under the "Attempts" Settings, simply increment the Attempts allowed number and save your settings. All users in the group can now take another attempt. Do this by going to their Results page for the test (the page that displays all their selected answers and grading for the Test), then under their Score you will see a link to change the Attempts allowed, here you can allow extra attempts for them. First things first, your tests are kept private in ClassMarker, this means only users who are given the Link to your test or go to your website where you have it embedded can access your test (below restrictions pending). Send the direct link to your test out to your test takers or add the link on your website. Add a link on your website which will link directly to your ClassMarker Online Quiz. Embed a test into your webpage by copying/pasting that code provided for you into the webpage. When giving your test via Links, the test-takers are considered to be "non-registered" users as they do not have to register and/or create an account first in order to take a test. Although these users are "non-registered", ClassMarker has made sure to include options that will fully restrict access to these tests, if required. You can password protect your test so only users who are given the password can access your test. 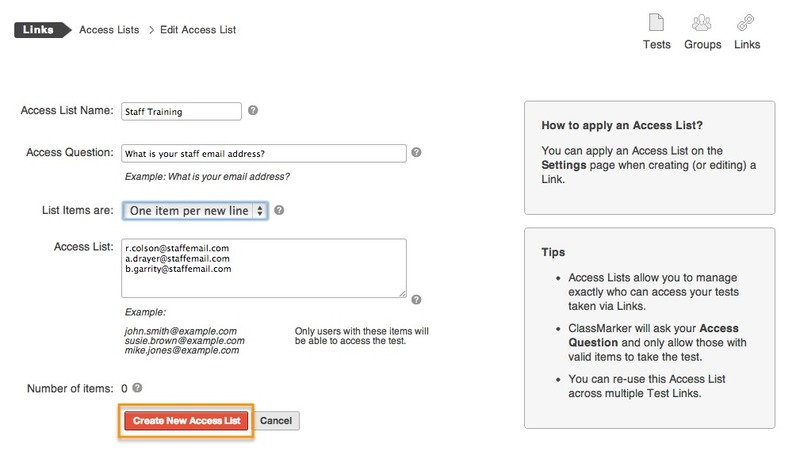 Access Lists enable you to restrict access to tests to only users who have an access code. Access lists consist of a list of Access Codes that are created by you and can be any alphanumeric string of your choosing (for example, email addresses, student/employee IDs, etc.). Now, let's go over the different options you have to limit the test attempts for Links. Any users with the link will be able to take the quiz an infinite number of times. Under your Test 'Settings' page > 'Test Access' > subsection 'Attempts', you would leave this as unlimited. With not Access list applied, the attempts allowed restriction for test-takers will be reset after a 24 hour period using cookies. Under your test 'settings' page > 'Test Access' > subsection 'Attempts', you would choose to select one or more than one attempt. Only users in the Access list can take the Test. Each of them can take the Test infinite number of times. Under your test 'settings' page > 'Test Access' > subsection 'Attempts', you would leave this as "unlimited". Then under the same section 'Test Access' > subsection 'Restrictions', you would choose to create an Access List or choose, from the drop down an already created access list. The access for users will be restricted to the absolute number of attempts as set in the "Attempts" settings. Then under the same section 'Test Access' > subsection 'Restrictions', you would choose to create an Access List or choose from your previously created access lists to re-use. Raise the "Attempts" setting by one via the Link settings page. Add and give the user a new Access List code to use to access the test. Alternatively you can delete the user's previous attempt (Results) to give them another attempt. One other method to give retakes is to create a new link that is just for retakes. You would then assign the same test to a newly created link, in which you could label it something such as "Test A - Retakes" so you know this is only for those who have taken retakes after the initial allowed attempts. This is a good option for those who are wanting to keep these test results separate. You can use the same Access list as well with this new Link. You can also give multiple online quizzes in a specific order. Did you know there are numerous other features available that ClassMarker offers with Links such as branding with your own logos and colors and Charge for tests. Learn How To Sell Your Quizzes And Exams Online.